Piano Moving requires skill, knowledge, experience, and strength. Lots of movers can move boxes or dressers. But piano moving is one of those things that you really need to leave to experts. If stairs are involved in your piano move, not only could it be a danger to your piano but to the people moving it if they are inexperienced. At Monster Movers, our piano moving experience ranges from the mundane to the insane. Our piano movers have all literally moved thousands of pianos. There is no other city with the narrow passageways, small to non-existent elevators and small stairwells as Boston. Our piano movers can move your piano. We move baby grand, grand, upright and spinet pianos. It is important to ask your piano movers what and how they will be wrapping your piano. If your piano movers don’t have the correct equipment it could be dangerous for your piano and the people moving your piano. Will you be completely padding and strapping my piano? Some piano movers do not completely pad and shrink wrap the entire piano leaving it open to the elements in the truck and while being moved. 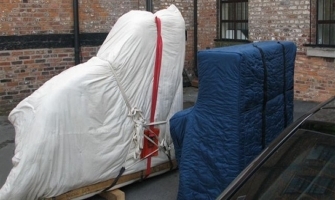 There are materials made just to relocate pianos – make sure your mover uses these. What is the coverage on a piano? First off, if your mover does not offer basic coverage on a piano move this is a red flag. Your mover should also offer full replacement value which will most likely result in a higher fee but will also protect one of your most valuable possessions. Moving Out-of-State? 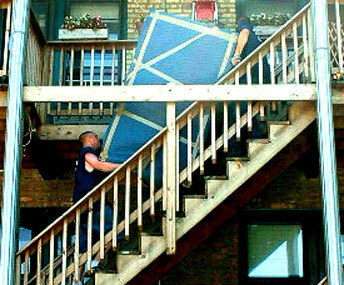 Monster Movers provides door-to-door long distance moving services including storage. We use smaller 26 ft moving trucks which means you will have your shipment in 1-4 days. No load swapping, shuttle fees, mileage fees, fuel surcharges, etc. Just Flat-Rate Long Distance Moving Services. Monster Movers provides flat rate moving services for all interstate shipments to and from MA. Why is it so important to hire a professional piano mover especially in the Boston area? Boston is notorious for it’s small spaces and completely insane moving conditions. I suggest hiring movers that will make your Boston Piano move as uneventful as absolutely possible.